‘er indoors TM went onto Argos’ web site last night to reserve some gas canisters. Their web site texted me the reservation number. This morning I turned up at the shop, typed in the number, and there it was. I’m impressed. Once equipped with Martin & Tony we set off (via the tackle shop) to Tesco’s. Supplies were bought, and we then popped into Starbucks. I don’t do that very often. They do good stuff, but they don’t give it away. And then to BatCamp. Martin & Batty had set up most of the stuff yesterday, but we still had the turdis to erect, and a poop-pit to excavate. 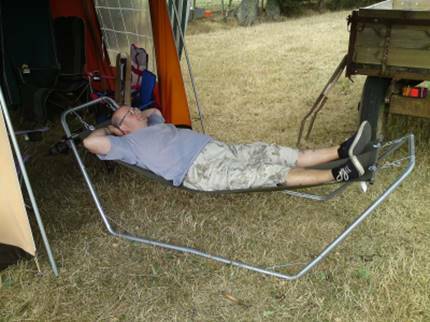 Those jobs didn’t take long, and then I put up my new £7 hammock (£7 – bargain!!) and dozed for most of the afternoon. Despite a late night last night, I was up before 7am. Seeing as the place was such a hive of industry, I went fishing for a couple of hours until people woke up. Having seen a heron and a shag (oo-er!) around the pond, I expected the strange looking bird I found there to be equally unwelcome. But despite my giving the bird evils, it continued to sit by the pondside, and it went to sleep. It turned out the bird was a Muscovy duck who lives there. I wandered back to camp shortly after 9am to find people beginning to move about, and we soon tucked into sossies, bacon and eggs. A quick dose of washing up, and then back to the fishing. The pond was only dug out a few years ago, and all of the fish in it are ones I caught in another pond and fetched over in a bucket. Those fish have really grown in a very short time, and are breeding. About mid day, some sixth sense told me to return to the camp site. I got there to find Terry and Irene had just arrived. We tucked into Ploughman’s lunch and a bottle or two of ale, and then Chip arrived with Ruth, Sam, the baby and “Daddies Little Angel TM ”. A pleasant afternoon was spent comparing the relative merits of various beers (hic) followed by a smashing bit of curry for tea, whilst various girlies shivered. For all that it was the August Bank Holiday, it wasn’t very warm. I did most of the washing up, but as the light was failing, I gave up. I’ve washed up in the dark before, and it’s a silly thing to do. I left it for the morning, and having said goodbye to our visitors, we sat around the fire until far too late…. Despite a gutful of beer yesterday, I was up, shaved, yesterday’s washing up done, and fishing before 7am. A successful couple of hours were spent at the pond before braving the campsite and hoping some brekky was on the go. Just as we tucked into bacon and eggs, “My Boy TM ” arrived with “Daddies Little Angel TM ”. Both had joined us for the day. This must be the first time since Xmas the whole family has done anything together. Following brekkie, the first order of the day was to shift one of the duck houses. Regular readers of my blog may recall a day last November when I nearly died of hypothermia-induced shock whilst installing the duck house into the pond. Unfortunately there is more to duck houses than just launching them into a pond. They require maintenance. So we eventually managed to get the duck house onto dry land, and then left it there to drain out. The thing had become somewhat waterlogged. “My Boy TM ” and I then spent a couple of hours fishing. In his pursuit of leviathans, he would seem to have lost the art of tiddler bashing, but he soon got the hang of it again. After dinner we wandered around the fields, and then back to the duck house. The thing had drained sufficiently to allow four of us to lift the thing onto a trailer. And then “My Boy TM ” got to drive the tractor & trailer back to the barn, and that was the last we saw of him for some time. He then used the tractor to help with muck spreading, to deliver a boat to one of the ponds, to round up sheep… he developed quite a rapport with that tractor. Having told me that he would only be along for a couple of hours, “My BoyTM ” spent most of the day with us. Busying around. His sister lazed around the campsite with her mother. Both seemed happy, which was probably for the best. They eventually set off some time in the late afternoon, and then I went fishing again. This time in the pond from which we had taken the duck house. The fish were bigger, but the pond was difficult to fish. There was hardly and space to move about, wield rods or land fish. Which was a problem as four of my catches needed the landing net. Oh, I woke up with such a backache today. Perhaps sleeping in a tent isn’t good for me? But I was up and fishing before 6am – it hurt to lie down. So I had another go at fishing in the “duckhouse pond”. I had nine fish, six big enough to need the landing net. And, to be honest, I didn’t enjoy it at all. There wasn’t enough room. No room to wave the rod about, no room for the net. I was constantly tangled in brambles. Next time I shall take the chain saw to the undergrowth. And then brekky – featuring omelette made up of all the leftovers. It was really great. And then we packed up camp. There’s something about BatCamp – at a kite festival we are up early, breakfasted and packed away by 11am at the latest. Today we were still fiddling around at 2pm. I suppose that because we are on home territory, there is no urgency. But eventually everything went back into the barn – that’s camping done for another year. And home to wash the laundry – in three days I’ve generated loads….